At the heart of an effective content marketing strategy is proper keyword research. The goal of your keyword strategy should be to define the biggest keyword ranking opportunities. There are many factors involved when considering which keywords you should create content around which is why we picked these top 10 reporting tools to uncover your website’s biggest opportunities to increase your online presence. Before embarking on any task that is SEO related I always do my due diligence. Believe it or not, Google wants you to be a successful marketer online and has documented a wealth of information to help understand their best practices. Follow their guidelines to reap the biggest rewards on your efforts. This documentation is directed towards keyword research for an adwords campaign but many of the same best practices hold true for organic efforts as well. 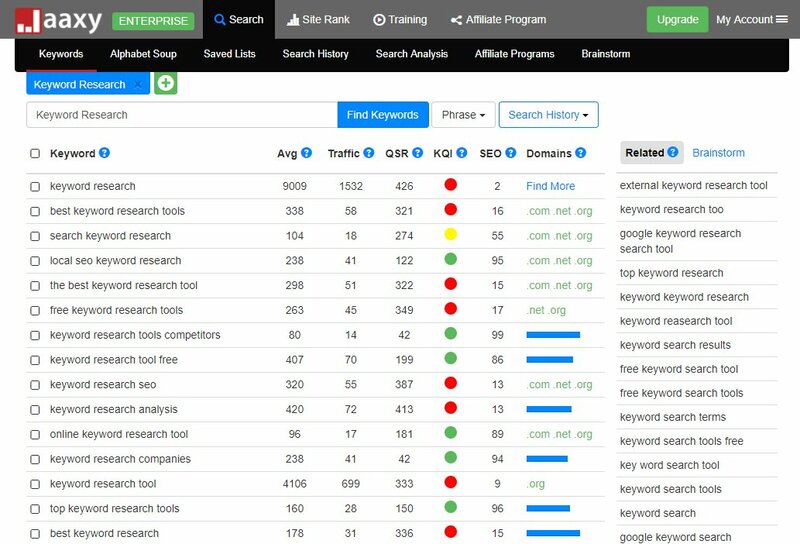 The Grand daddy Keyword Research tool to rule them all. 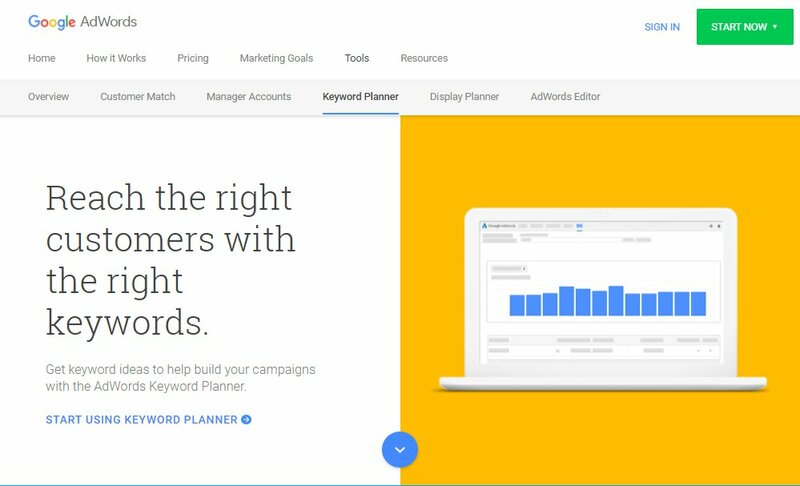 Google’s keyword planner offers a vast and comprehensive review of anything and everything keyword related. Many users do suffer from information overload which is why we have 9 other options to help you on your journey. Many of the tools online all pull data from Google’s open infrastructure. Get the data straight from the source with this free tool to help understand the competitive landscape of each keyword. SpyFu is an outstanding resource for understanding not only the competitive landscape and difficulty of a keyword but also offers suggestions based on your specific domain and best of all. SpyFu premium users have the option to import keywords that may not be tracked due to low search volume. 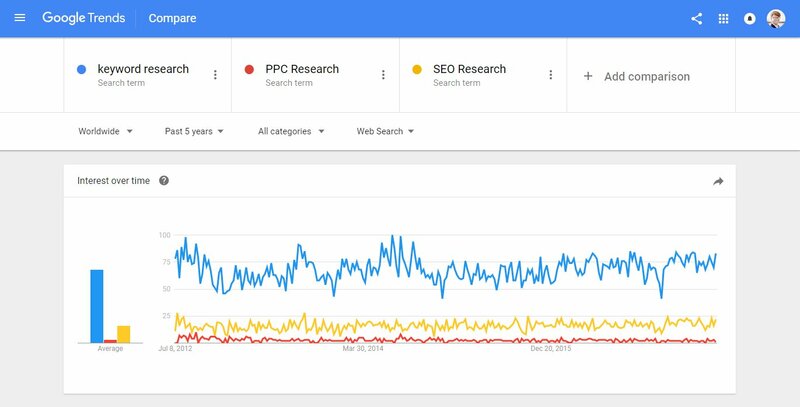 The proprietary keyword research tools are constantly getting better thus makes planning and tracking your campaign easier and more comprehensive than ever. 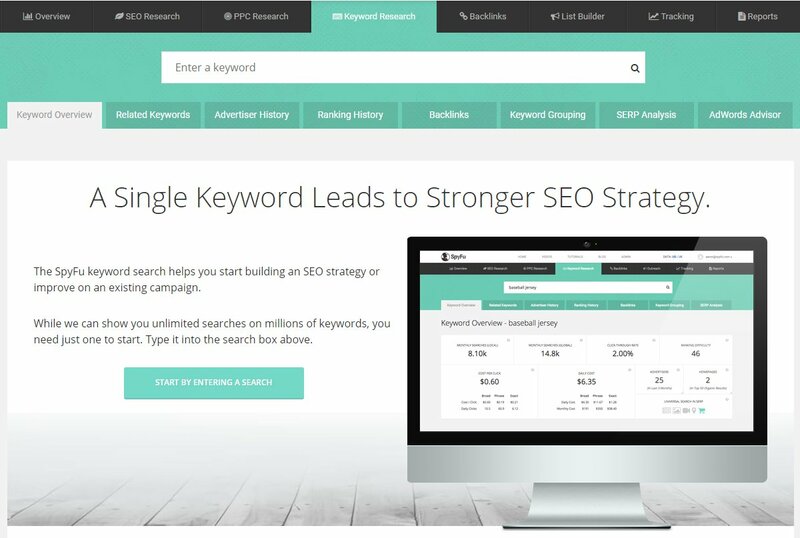 SpyFu offers reports for keyword overview, related keywords, advertiser history, ranking history, backlinks, keyword groupings, SERP analysis, AdWords Advisor ( for those running a paid campaign ) and many other tools related to online marketing. 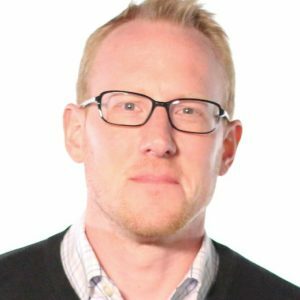 By now you have most likely already heard of MOZ, or have used their services. The free Keyword Explorer adds a flavorful dashboard rich with infographics for those visual learners out there. The dashboard’s layout makes information overload less of a risk over the Google and SpyFu option but the lack of comprehensive data makes this tool a slightly less shiny option despite being a powerhouse in the digital marketing world. 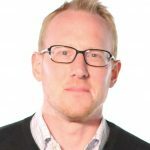 Boasting a suite of client advocates including ebay, amazon, Disney, HP and more, SEM Rush comes in on our list at a well deserved 4. What the dashboard lacks in sexiness it makes up for in data comprehensiveness. 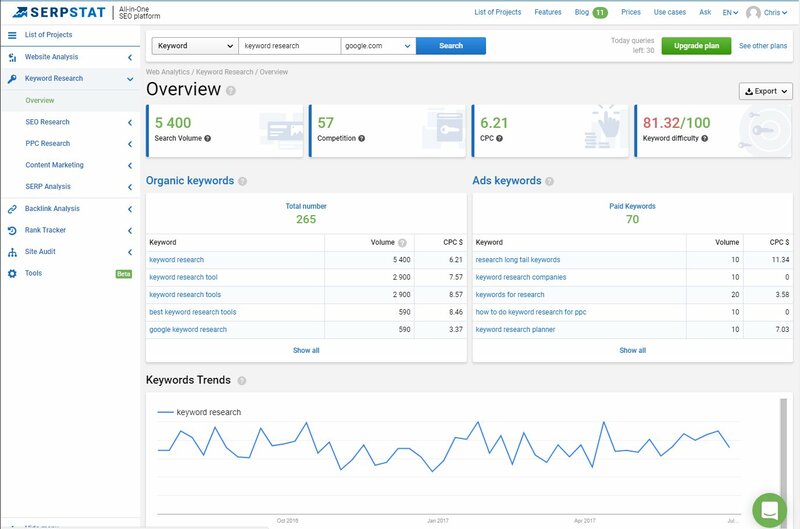 The dashboard offers exact match keyword reporting as well as suggested related keywords based on a volume to competitiveness ratio. Google trends was a keyword research tool way before it was cool. I do love the features and layout of their reporting dashboard, but unfortunately, many of their competitors use the same sourced data and do a more comprehensive job of offering data and recommendations. For this reason, we are ranking Google Trends at number 5 on our top 10 favorite keyword research tools. Ranking this proprietary tool at number 6 is most likely doing them a disservice considering the scope of data offered in their suite of free metrics. 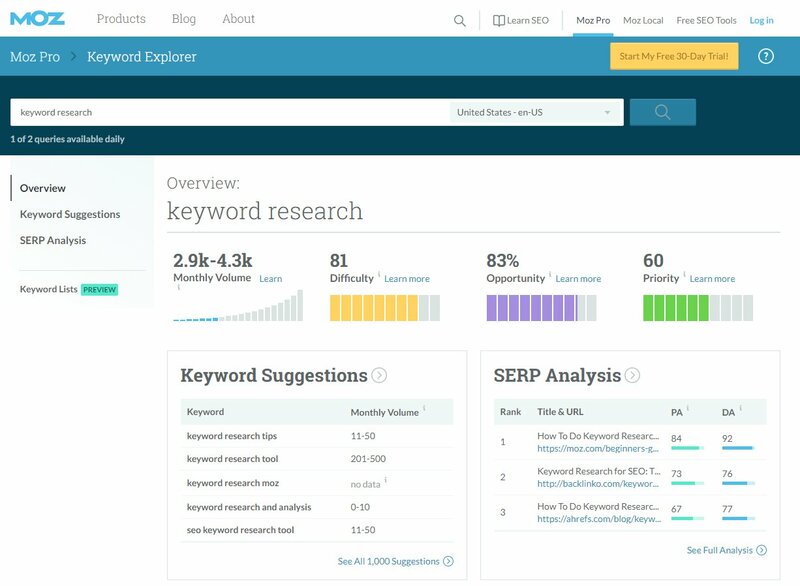 SERPSTAT’s main unique advantage is the option to offer keyword statistics for each individual page. This is impressive considering the algorithm needed to figure this out is too sophisticated to undertake by most keyword research companies. 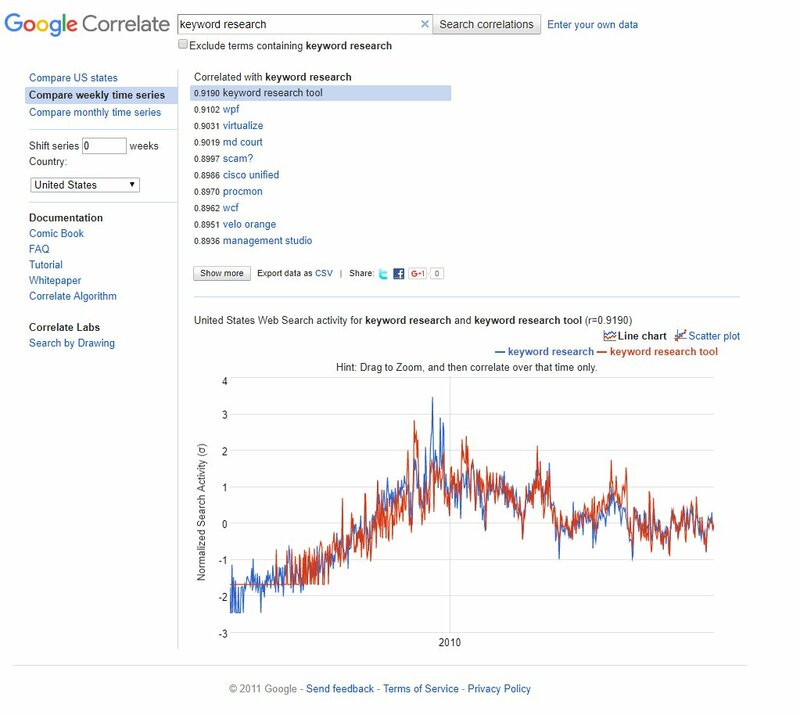 What Google Correlate lacks in luster it makes up with in cold hard data. There is no other way to explain Google Correlate other than the best-kept secret in regards to gaining insight on keyword data. Google is even kind enough to allow the user to download the data in a csv to work with the dataset internally. Googles generosity and open doors to their data is the catch 22 of why they are coming in at a surprisingly meek 7. Many of the tools mentioned in this blog repurpose this data into better-looking dashboards aestetically more rewarding experience. 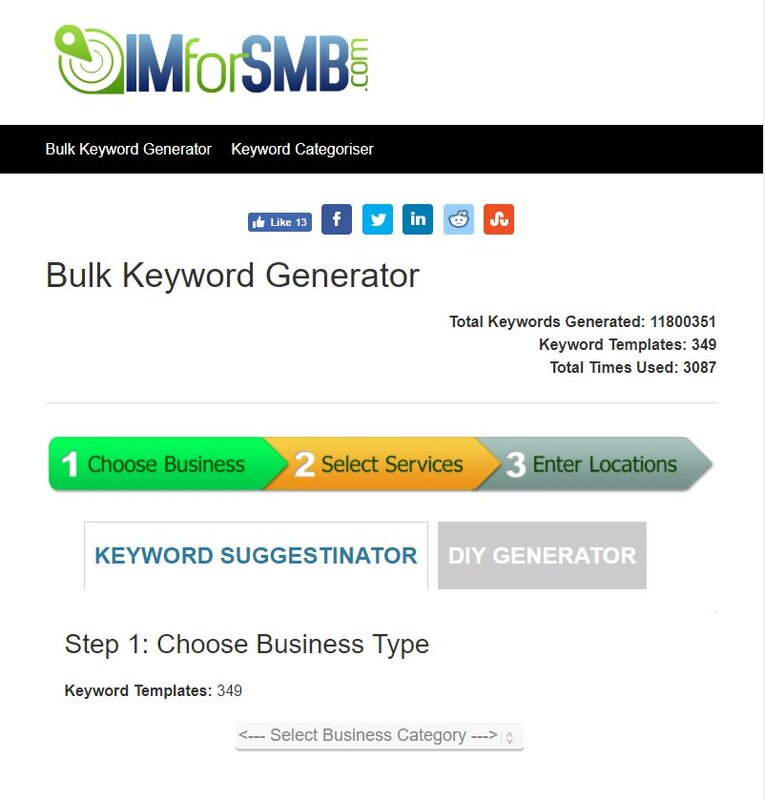 IMfor SMB makes the list due to it’s unique method in which keywords are recommended. This tool allows the user to generate keywords based on the business type and location. This tool would be relevant for those who simply don’t know where to begin. One tool I personally appreciate is the export option for CSV for the user who likes to run their own custom reports. Jaaxy is an oldie but goodie for those who crave the sweet nostalgia of good old fashioned keyword research. 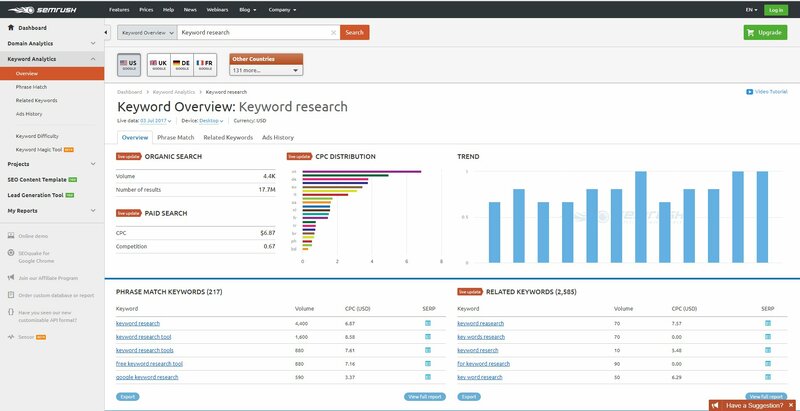 Jaaxy’s unique and rich keyword suggestion features have allowed it to survive the diverse and ever-evolving landscape of marketing tools. Jaaxy’s forte lies in it’s ability to give niche metrics for some of those less competitive, yet highly sought after longtail keywords. Finishing the list strong is Google’s Search Console, but not for the reasons you may assume. 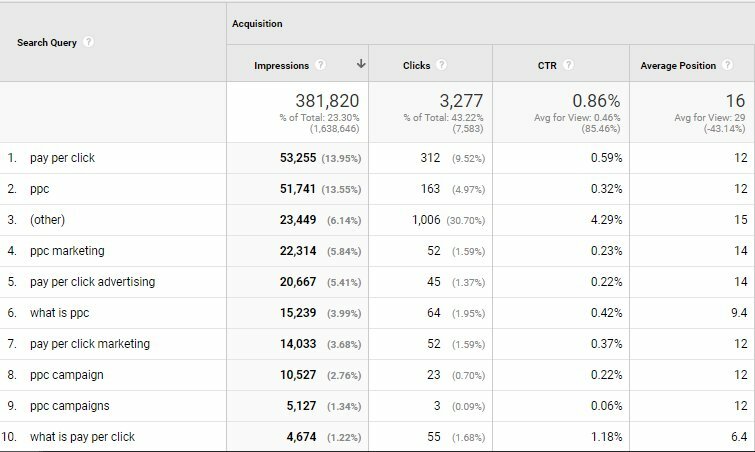 When Search Console is connected to Google Analytics it offers powerful insight to the keywords your content is already ranking for. If your main goal is getting your content seen then you need to take a good hard look in the mirror to discovery what unseen opportunities lie within the hard work you have already put into your account. Tweak content based on the exact keywords your landing pages are ranking for. For help achieving this you may contact us to learn more about the process. Note: Optimizing your site for keywords via Search Console is mainly geared towards organic channels ( search engine traffic ) so this tool may be less relevant to those looking for PPC keyword research. In conclusion, there are many free tools out there with valuable insight to help you make data-driven decisions. Prioritize content marketing efforts based on real data and you will take the guesswork out of the equation.